Largest of the Cyclades. Craggy peaks, lush gardens and terraced vineyards. If youre into walking this is a treat. 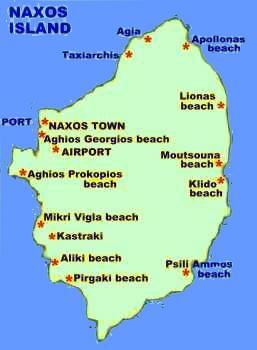 Naxos Town mixes tradition and tourism with ease and just a little way south is the delightfully unspoiled Plaka beach. Also worth visiting is the Venetian quarter in Naxos town and the Porta archaeological site at the entrance of Naxos harbor.